This is a kind of fine quality soap dispenser, big capacity, stainless steel construction, with long service time. Upgraded motor gear settings make the motor turn more smoothly and more powerful. Immediate and controllable detection: Hands off(gently), detection stops, needless to worry about waste of soap, and makes your room tidy and convenient. Try it. Upgraded motor gear settings make the motor turn more smoothly and more powerful. Anti-interference sensor: Effectively strengthen the ability of infrared anti-interfrence, can dect your hands accurately and speedy. 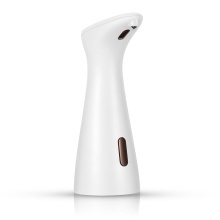 Built-in infrared smart sensor, make soap out with short induction time, once laying your hand. Convenient On-off Button: Only one gentle press of the power button can easily turn on / off the device. The blue indicator lamp will turn on while output hand soap. 1 ml hand soap output volume, if you wanna more, please wait for 2 seconds, and it will output 1 ml hand soap. Immediate and controllable detection: Hands off(gently), detection stops, needless to worry about waste of soap, and makes your room tidy and convenient. 200ml capacity, IPX6 waterproof, ABS outershell construction, provides long service time. Fully automatic and touching free operation, to refrain the second cross-infection and and germ transfer. Innovative non-drip design, eliminate waste and refrain countertop mess. The shape is exquisite and compact, large opening design, easy to fill, the process is tidy and clean. Ideal for dispensing shower gel, shampoo, washing lotion, soaps or sanitizers, etc. Perfect for use in home bathrooms, offices, schools, hospitals, hotels, shopping center, and etc.